After discussing the various options that are available for your particular health challenges, we will then go into an explanation of the specifics of our approach in a detailed and easy to understand way. This will help you to understand the dramatic positive impact our approach can have on your health issues. Our office is specially equipped to focus on Structural Chiropractic Correction. As a result of investing in the additional training and technology required to give complete Structural Chiropractic Correction, we are able to address all of the components of a Structural Shift that may occur. We are able put our training and equipment to work for you to address the shifted spinal segments, the muscles, the intervertebral discs, and even the nerves which are being affected by the Structural Shift. 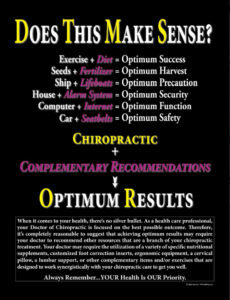 While most people assume that all chiropractors adjust the spine, that is actually not true. 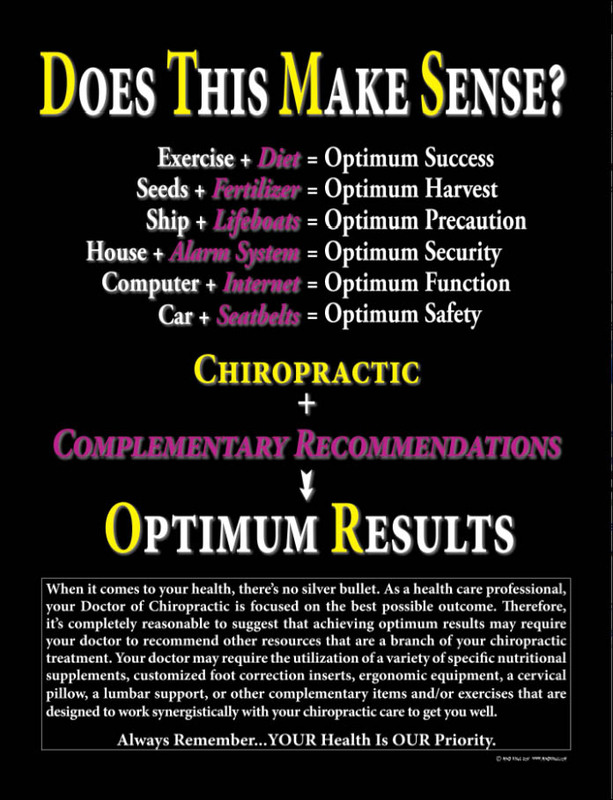 We frequently will have patients seek our care that report to us that their previous chiropractor never adjusted them, but rather elected to use nutritional supplements or muscle therapy to try to correct their problem. Additionally, we are not a “one-size fits all” sort of office. Our adjustments are truly tailored to the needs and wants of our patients. We have trained in a wide variety of adjusting techniques and have then honed those approaches based on the most effective per research and clinical outcome. Our office is equipped, and Dr. Willemin is trained, to use structural techniques that range from instrument assisted adjustments, specialized table assisted adjustments, and manual adjustments based on the needs and wants of the patient. We even have special equipment that qualifies under the American Disability Act to help provide access to care, regardless of your physical limitations. One component frequently involved in Structural Shifts are changes to the intervertebral discs. People will frequently report that they have “slipped discs”, “bulging discs” or “herniated discs” in their back or neck, but no one has taken the time to give them the full clinical picture. Injuries to the intervertebral discs are complex and can involve a variety of presentations and structures. We are, to our knowledge, the only office with a specialized Spinal Decompression Table in Rochester. We have helped many of our patients avoid unnecessary surgery with our ability to retract disc herniations and address the underlying Structural Shifts. Our office is equipped with multiple other specialized tables and equipment to provide Structural Chiropractic Correction which address both flexion AND extension. Structural Shifts are not limited to presenting in only one direction, and so we are prepared for any of those presentations. We have the necessary equipment to address the spine completely – whether it requires isolated rehabilitation of one region of the spine or broad rehabilitation of multiple regions of the spine. While all tissue healing takes time we have committed our office to getting the best results as fast as possible. We know that a major component of a Structural Shift are the soft tissues (things like muscles, tendons, and ligaments). Injuries to soft tissues have to go through 4 distinct stages, and frequently, these injuries are pain generating. We offer safe and effective Class IV Low Level Laser Therapy to help speed up soft tissue recovery. While most massages feel great while you’re receiving them, our goal is to use coordinated care between our highly skilled Licensed Massage Therapists to provide the right care to facilitate great outcomes when Structural Shifts have occurred. Additionally, our massage therapists use 100% pure natural oils. Many massage oils and creams use harsh compounds which can cause skin irritation, inflammation, and have even been associated with certain types of cancer. Our natural oils make sure you aren’t left with new issues for your body to cope with. We also offer essential oil boosts to our massages to improve the relaxation and stress reducing effects of the massage. Whether you are looking to improve athletic performance, trying to restore your ability to perform your daily routine, or hoping to prevent falls and injuries, your body’s ability to know where it is and move is essential to your daily life. Structural Shifts can result in losses in these areas. As we correct the underlying Structural Shifts we will also be re-training your body in these essential functions to make sure your body performs at top level. There are not a lot of chiropractors that focus on Structural Correction, and even fewer that have all the special equipment we have to help address all the components of a Structural Shift. We will take the time to share with you exactly what makes our approach unique, and how a Structural Shift (if detected during your examination) is associated with your Secondary Condition. Lastly, we will present a customized care plan that is carefully designed to take you from where you are to where you need to be, by addressing all aspects of the presentation of your specific Structural Shift (once again – if detected during your examination). We want you to get to enjoy your life, so we will help establish a sound structural foundation. We will also explain how to maintain your correction, while protecting your spine and nervous system after your Structural Correction has been achieved.